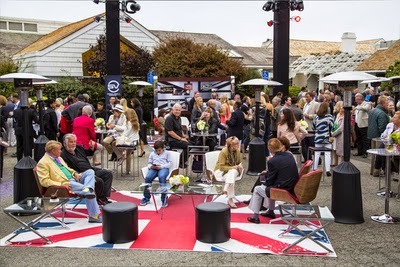 This past weekend at the Pebble Beach Concours d'Elegance in Monterey, California, Jaguar Land Rover revealed the US production version of its Project 7 sports car, based on the highly successful Jaguar F-type roadster. 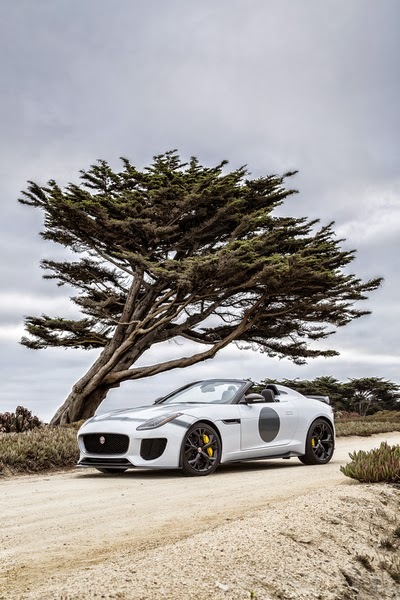 The production version of the F-TYPE Project 7 is an all-aluminum, fully road-legal two-seater roadster with bespoke carbon-fiber aerodynamic aids and is the pinnacle of the F-TYPE range. Named to reflect seven Jaguar overall wins at the 24 Hours of Le Mans, F-TYPE Project 7 is inspired by the Jaguar D-Type which celebrates its 60th anniversary this year. 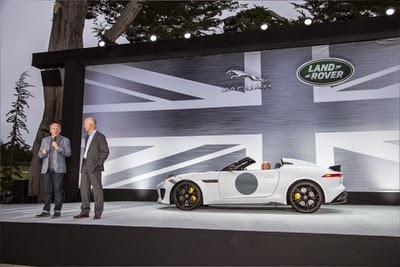 The F-TYPE Project 7 will come to market in the USA with a starting price of $165,000. Project 7 will be available in two standard color schemes – Glacier White, a metallic white which is the feature color for the model and Ultra Blue, a metallic take on French Racing Blue and the signature color of the Jaguar Land Rover SVO team. British Racing Green, Ultimate Black and Caldera Red will also be available as optional upgrades.